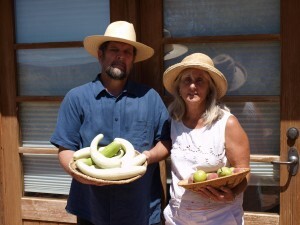 Six years ago, Gary Nabhan and Laurie Monti purchased a five and a half acre farmstead above the Native Seeds/SEARCH grow-out farm, where they are demonstrating how desert-adapted agro-biodiversity can be integrated into water-conserving farming systems for climate-friendly food production. Their farmstead is named Almuñia de los Zopilotes—the Experimental Farm of the Turkey Vultures— to connect to the thousand year legacy of such biodiverse farms in Andalucia Spain, North Africa and the Middle East. You are invited to come and visit—or reserve (two weeks in advance) the guest house for a work/study home-stay—to learn not only the heritage food plant and animal varieties being produced, but the water-harvesting strategies being used to reduce on-farm groundwater and fossil fuel uses. 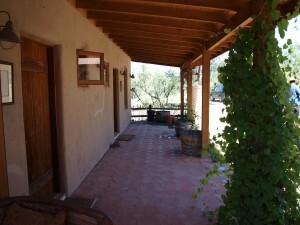 The cost per night of stay (without meals) is $50 per individual, $75 per couple or $100 per family. More than a thousand years ago in Moorish Spain, farmer-scholars developed private experimental farms called almuñias to introduce and evaluate new crop varieties, adapt and select ancient ones for new uses, and implement water- and energy-saving cropping strategies. Today, inspired by his late mentor’s Juan Estevan Arrellano’s book, Ancient Agriculture, Gary is developing the first-ever almuñia on Arizona soil, at a 4000 feet elevation in mesquite grasslands. Over 140 heirloom fruit tree varieties have been planted for evaluation—including dozens of pomegranates from around the world—and 2016 will be the first year that the trees will produce enough heritage fruits to supply Gary and Laurie’s canning kitchen (see below). The farm also features terraces with prehistoric agave varieties of southern Arizona and northern Sonora, a wide variety of perennial culinary herbs and spices, and two greenhouses. Desert pupfish propagation for formal native fish reintroduction projects continues in the acre pond just below the greenhouse/orchard complex. An Orchard with a Mission: Gary collaborated with former grad student Nate O’Meara of Kitchen Gardens, Inc. to design a water-harvesting based orchard of some of the rarest but prolific Mission-era heritage fruit and nut varieties remaining in the Americas. To date, they have planted Mission olives, Mission figs, Mission grapes, Texas Mission almonds, Santa Barbara Mission pears, Sonoran pomegranates, Sonoran quince, Baja California Mission guavas, in addition to Kandal Sinap, Black Oxford, Yellow Bellflower and Winter Banana apples, pistachios and apricots. Using the theory of nurse plant ecology these tree crops shelter an understory of globe artichokes, perennial chile peppers, onions, shallots, bay leaves, rhubarb, purslane, amaranth and asparagus. A Succulent Slope: Gary designed water micro-catchments integrated with cobble terraces for the low-maintenance production of three mescal species and eight prickly-pear cactus species, in addition to coppiced mesquite trees that provide both edible pods and bio-char for soil improvements. Healing Rain Gardens at Our Doorstep: Laurie, a trained herbalist and medical anthropologist guided Gary and Nate’s selections of medicinal plants for the dooryard garden in their front and side courtyards. It includes Mormon tea, wild oreganos, aloes, lavenders, sages, bushmints, thymes, rosemaries, chiltepins, corianders, mescal beans, and many other herbs. Now that the orchards and herb gardens are bearing sufficient fruit, Gary has begun to produce healthful fruit beverages that are herb-infused and stabilized by fruit vinegars. 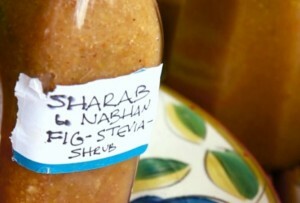 These syrups are part of an ancient Arab and Persian tradition, and are called sharabs, or in English, shrubs. Each offering from the Nabhan orchard will be labeled to its particular heirloom variety of fruit, its botanical sugar substitute, its herbal infusion and vinegar type. Shrubs have allowed mixologists across the country and in Tucson’s Downtown Renaissance area to feature the taste of their place, and innovate with new mixed drinks. A portion of profits will go to the Iskashitaa Refugee Network (from which we will also purchase vinegars) and the Borderlands Habitat Network. Thanks to a successful Barnraiser crowd-funding campaign, a commercially (food-safety) certified canning kitchen will be completed by mid-summer 2016. Hoping to soon follow through on an invitation from WWOOF to host for homestays students interns interested in organic farming, Gary has begun the laborious process of getting the farm certified organic. WWOOF- World Wide Opportunities on Organic Farms and other programs such as Earlham College’s Borderlands Studies Program have contacted Gary about regularly placing students at the farm, so Gary and Laurie have dedicated their two-room guest house for prospective visitors, whether affiliated with such programs or on their own. Gary can mentor students in desert agro-ecology, agro-biodiversity, seed-saving, water-harvesting, on-farm pollination enhancement or climate-friendly strategies for local food production. All training opportunities are customized and personalized for individuals or small groups.